On Janni Talu there is a tiny lamb whose mother has not enough milk to feed him. He is fed instead by an obliging Nanny goat, who has extra milk. Because of the extra attention he receives from Joel and Julika, he is unafraid of people, and very friendly and vocal. The tiny lamb has a tiny sound. The phrase “Wool on the Hoof” comes from an agricultural award I saw at Jane Knowles’ house in Cumbria, in the UK. This prize is awarded in the UK to the sheep with the most excellent fleeces, according to breed specifications. Jane and Brian Knowles’ Rough Fell sheep have won this award several times, because their fleeces are – as per the breed – long, strong, white, characterful, and perfect for stuffing mattresses! There is no “Wool on the Hoof” agricultural prize in Estonia as far as I know, but several shepherds and wool enthusiasts have built the organisation “Hea Villa Selts”, which means “Good Wool Society”. Surely the sheep grown by members of Hea Villa Selts would be the most likely candidates for the “Wool on the Hoof” prize-category, if such a competition existed in Estonia? Here is Jane talking about the mothering qualities of the Rough Fell Sheep. UK Sheep mothers; Estonian Sheep lamb. Here is the sound of the flock of sheep which lives on Jaani Talu – one of the most wonderful places in all of Estonia – where Joel and Julika Roos keep Estonian Native Sheep; Åland Sheep; Swedish Finewool Sheep; Estonian Native Ruhnu Sheep; and various cross-bred animals which they are developing themselves in order to improve the quality of wool grown on their farm. Julika is a member of Hea Villa Selts, which means Good Wool Society, and there will be more information about the wool produced from the Jaani Talu flock in coming days on Felicity Ford’s blog. 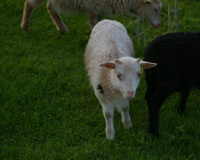 Here is Joel and Julika’s blog, and here are their sheep. The huge variety in the colours of the sheep at Jaani Talu is matched only by the range of sounds they produce! This is the sound of Amy Black’s Rough Fell Sheep munching and baa-ing up on their fell in the Lake District. The Lake District is characterised by many high fells and steep valleys, and the Rough Fell sheep has developed to be particularly suited to this topography. In Estonia, the highest point – Suur Munamägi, located in Haanja village, Haanja Parish, Võru County – is 318m above sea level. The two native sheep breeds (yet to be heard by Felicity in her adventures) – the black headed sheep and the white headed sheep – have not evolved as the Rough Fell sheep has, to live in extremely elevated conditions. How these factors might influence the sonic qualities of Estonian sheep remains to be seen.